0.001) tumors. 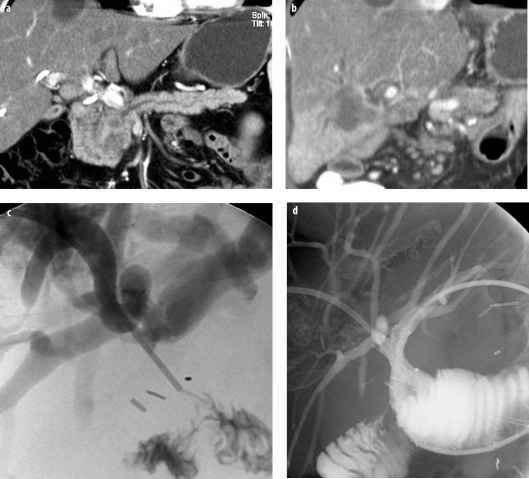 Preliminary reports have shown that RFA performed after balloon catheter occlusion of the hepatic artery, transarterial embolization, or chemoem-bolization results in increased volumes of coagulation necrosis, thus enabling successful destruction of large HCC lesions. However, for the time being, laser and ra-diofrequency therapy can be used to treat only lesions with a maximum diameter of 5 cm. However, these techniques are developing rapidly. There is little experience in ablation of renal tumors. Ablation of renal cell carcinoma has been performed either in patients with a single kidney or with serious contraindications to surgery. Percutaneous ablation needs to be balanced against other minimally invasive techniques such as la-paroscopic kidney removal or partial nephrectomy. Both in renal and hepatic tumor ablation, some patients, especially those with hypervascularized tumors, may profit from a combined approach with both ablation and transarterial embolization. Fig. 3. Biliary obstruction due to metastases of pancreatic carcinoma. 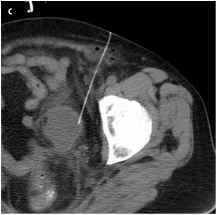 a CT of pancreatic carcinoma before surgery. b CT one year after surgery (tumor resection) demonstrating obstructed common hepatic duct due to tumor recurrence at the liver hilum. c PTCD showing obstruction of the bilioenteric anastomosis. d Bilateral stenting of the obstructed hepatojejunostomy show longer patency rates than plastic tubes. Drainage of the gallbladder is rarely performed, but sometimes helpful in multimorbid patients. As a palliative approach or a temporary solution in patients with obstructing tumors of the duodenum or the colon, metallic stents are placed as an alternative to surgical decompression. Several kits exist that enable radiologists to perform gas-trostomy and ileostomy using a percutaneous approach. Indications are in patients with long-term swallowing disorders due to tumors or neurological deficiencies. As a palliative approach to treat ascites, either percutaneous creation of a Denver shunt or percutaneous port-catheter placement - to allow repeat and ease paracentesis have been described. The symptoms of acute ischemia are dependent on the involved vascular territory. 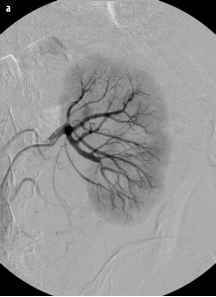 Embolization to the liver or spleen may cause acute right or left upper abdominal pain. Acute mesenteric ischemia typically causes severe abdominal pain and bowel paralysis. 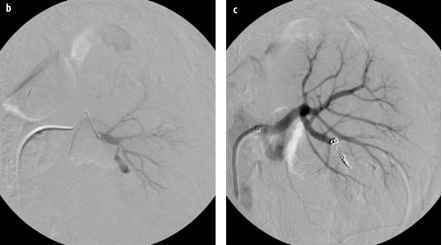 Embolization to the kidney causes flank pain, hematuria and hypertension. In any case, severe elevation of lactose dehydrogenase (LDH) points to the ischemic nature of the acute pain. In case of complete ischemia without a sufficient collateral circulation, the warm ischemic time tolerated by the abdominal organs is less than six hours. Therefore, acute diagnosis and therapy are mandatory. The primary diagnosis is performed by CT with contrast enhancement (CM 300 mgJ/ml; 4 ml/sec; total bolus volume 80-120 ml; bolus care technique with 20-40 second delay; 2 mm collimation; pitch 2; reconstruction interval 1 mm). The obstructing embolus and the is-chemic territory can be visualized in the arterial phase. In the delayed phase, a residual perfusion through collateral arteries may be demonstrated. Interventional treatment with a thrombectomy device and/or local intra-arterial fibrinolysis with recombinant tissue plasminogen activator (rt-PA) (10 mg loading dose, 5 mg/hr infusion dose) or urokinase (250 000 IU loading dose, 100 000 IU/hr infusion dose) together with a G IIb/IIIa antagonist (Aciximab: 0.25 mg/kg loading dose, 0.125 mg/kg/hr infusion dose) is one option. The other option is surgery, which may be faster and also enables inspection and, if necessary, resection of ischemic organs. Dissection is most common if there is a history of trauma, chronic severe hypertension, or a connective tissue disease such as Marfan syndrome or Ehlers-Danlos syndrome. Acute type A and B aortic dissection may cause dynamic compression of the original lumen of the aorta by the pressurized false lumen. 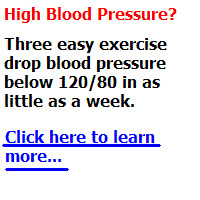 This can cause acute ischemia of liver/spleen, bowel and kidneys. The dissection plane may also run into one of the organ arteries causing obstruction of the true lumen. There are a number of in-terventional treatment options. In case of a dynamic compression of the true aortic lumen, occlusion of the proximal entry into the false lumen with an aortic stentgraft will cause decompression of the false lumen and results in reopening of the true lumen of the aorta and the side branches. In case of a static compression due to a side-branch dissection, stent placement in the true lumen of the organ artery will cause reconstitution of organ perfusion. In case of organ perfusion through the false lumen, balloon fenestration of the intimal flap will re-establish flow into the malperfused territory. 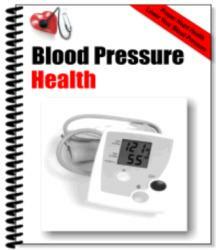 The primary cause of chronic arterial occlusive disease in elderly patients is arteriosclerosis. The primary diagnosis is made by aortic arteriography in a lateral projection by either intra-arterial catheter an-giography, CT angiography, or MR angiography. Interventional treatment is percutaneous transluminal angioplasty (PTA) with or without secondary stent placement of at least one of the obstructed arteries (Fig. 4). Chronic obstruction may remain asymptomatic because of the collateral pathways through gastroduodenal and pancreatic arteries from the superior mesenteric artery. Causes are arteriosclerotic plaque, compression by the arcuate ligament or carcinoma of the pancreas. Post prandial abdominal pain, called 'angina abdomi-nalis' occurs only if two or all three gastrointestinal arteries are obstructed. Causes for SMA obstruction are arteriosclerosis, fibromuscular disease (FMD), Takayasu arteritis, pancreatic carcinoma or chronic pancreatitis. Obstruction of the IMA is most commonly observed in patients with advanced atheromatosis or partially thrombosed abdominal aortic aneurysm. Due to the collateral circulation through the arc of Riolan and the marginal artery, IMA obstruction normally remains asymptomatic. The correct algorithm for the diagnosis of a renal artery stenosis is not established. Color duplex ultrasound is a noninvasive test but is a complex examination and requires an experienced operator. An increased peak systolic velocity of more than 200 cm/s, a renal-to-aortic ratio of peak systolic velocity of more than 3.5, an intrastenotic turbulence and a flattened pulse wave in the periphery (pulsus tardus) are diagnostic criteria for a renal artery stenosis. The sensitivity of color duplex sonography for detection of RAS of more than 70% is 72-92%. Color duplex US with an an-giotensin-converting enzyme (ACE) inhibitor provides a positive predictive value of 67-95% for cure or improvement after revascularization. ylenetriaminepentaacetic acid [DTPA]) with an ACE inhibitor (captopril 25 mg) shows a delayed wash-out of the tracer within the post stenotic kidney. However, in bilateral disease and in chronic ischemic nephropathy, the lateralization of the tracer is less evident. In a selected population with a clinical high risk for RAS, the sensitivity for detection of a unilateral RAS of more than 70% is 5196% (mean 82%). Its positive predictive value for a RAS with improvement of hypertension after revascularization is 51-100% (mean 85%). However, scintigraphy is much less sensitive in patients who are unselected, or have bilateral disease, impaired renal function, urinary obstruction or chronic ACE inhibitor intake. Newer tests are gadolinium-enhanced magnetic resonance angiography (MRA) and spiral CT angiography (CTA). For a state-of-art MRA, high field-strength systems with high performance gradients are necessary for breath-hold 3D spoiled gradient-echo imaging with short repetition time (TR) and echo time (TE). Intravenous administration of gadolinium contrast material in a double dose (0.2 mmol/kg; 2 ml/sec flow rate), a central k-space readout and background subtraction are additional techniques to improve signal-to-noise ratio and spatial resolution. The sensitivity to detect a RAS of more than 50% is more than 95% with MRA. The main limitations of renal MRA are evaluation of small, accessory renal arteries and branch vessels, the presence of stents and a tendency to overestimate moderate stenoses. CTA of the renal arteries has a sensitivity of more than 95% to detect RAS and accessory renal arteries. For a high quality opacification of the renal arteries and to avoid renal vein overlap, a correct bolus planning is mandatory (density measurement during bolus rise, flow 4 ml/s, total volume 80-120 ml - multidetector scanners need less contrast). A short breath-hold acqui sition, collimation (1-2 mm), pitch (1.5-6, depending on single or multidetector technology) and overlap of reconstruction (0.5-0.75) are important parameters for the spatial resolution of the study. Curved planar reconstruction (CPR, most useful for stents), volume rendering and maximum intensity projection (MIP) are used for 3D imaging (Fig. 5). Intra-arterial catheter arteriography together with pressure gradient measurement is still the 'gold standard' for evaluation of a RAS. The revascularization technique of choice is renal PTA without or with stent placement (Fig. 5). Aorto-renal bypass surgery is indicated only if PTA fails. In a recently published meta-analysis, renal arterial stent placement proved to be technical superior and clinically comparable to renal PTA alone. The technical success rate of stent versus PTA was 98% versus 77% and the restenosis rate was 17% and 26%, respectively (p < 0.001). In hypertension the cure rate of PTA stent versus was 10% versus 20%, the rate of improvement was 53% and 49%, respectively. 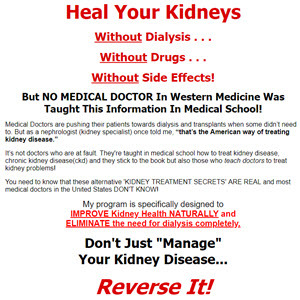 In renal insufficiency, the rate of improvement was 38% versus 30%, of stabilization 41% and 38%, respectively. The complication rate was 11-13% (95% CI 619%), the in-hospital mortality rate, 1%. In a randomized study comparing stents to PTA in ostial stenoses, the technical success rate was 88% versus 57% and the six month primary patency rate was 75% versus 29%, respectively. Two randomized trials comparing the effect of PTA and drug therapy on renal hypertension did not reveal a significant benefit of PTA over continuous drug therapy. However, in the Dutch study, PTA patients required only 2.1 versus 3.2 daily drug doses (p < 0.001) and 22/53 patients in the drug group had to be switched to the PTA group because of persistent hypertension or deterioration of renal function. Fig. 5. Patient with abdominal aortic aneurysm and renal artery stenosis. a CTA with MIP reconstruction. b Aortography before stentgraft placement. c After stentgraft implantation. d Renal artery stenting after stentgraft implantation. e After renal stenting. f Control CTA after renal artery stent and AAA stentgraft peripheral arterial disease (PAD) die from rupture of aneurysm disease. Currently, the standard treatment is open surgery. However, endovascular implantation of stentgrafts is a new, emerging technique which may replace open surgery in the future. Since the first clinical implant of a tube stentgraft in 1990, many different stentgraft designs have been developed and tested in feasibility studies. Most recently, randomized studies (EVAR 1 Trial, Dream Trial) compared the results of open versus endovascular repair. In the EVAR Trial the 30 day mortality in the EVAR group was 1.7% (9/531) versus 4.7% (24/516) in the open repair group (p = 0.009). Four years after randomization, all-cause mortality was similar in the two groups (about 28%; p = 0.46), although there was a persistent reduction in aneurysm-related deaths in the EVAR group (4% versus 7%; p = 0.04). • Inflammatory aneurysm, horse-shoe kidney. • More than 15 mm overlap within the iliac arteries. Endovascular implantation of stentgrafts can be performed under general, epidural or local anesthesia. The use of epidural anesthesia is a major advantage in elderly and high-risk patients. Stentgrafts have a self-expandable stent structure covered by an ultrathin polyester or ePTFE fabric. Currently, only bifurcated stentgrafts are used for the treatment of AAA. Contrast-enhanced spiral CT with multiplanar reconstruction (MPR) or MIP reconstruction is the most important examination before stentgraft implantation (Fig. 5). The diameter of the landing zones (infrarenal neck, iliac arteries), the maximum diameter of the aneurysm, thrombus, and calcifications can be well depicted by CT. The largest database currently available is the Eurostar registry, which has more than 7000 patients. At completion angiography, endoleaks were demonstrated in 15.8% of patients. Type 1 endoleaks were observed in 4.1%, type 2 reperfusion endoleaks were observed in 9.8% and type 3 leaks in 1.9% of patients. Technically successful stentgraft placement was achieved in 99% of patients. Conversion to open surgery was required in 0.7%. The inhospital mortality rate was 2.6%. Life-table analysis revealed a survival rate of 92%, 84%, and 77% at 1, 3, and 5 years, respectively. The freedom from persistent endoleaks was 84%, 75%, and 69% at 1, 3, and 5 years, respectively. However, type 2 en-doleaks turned out to be rather benign, not causing rupture in the vast majority of cases. 98% of the patients were free from aneurysm rupture at 5 years. Aneurysms of the celiac trunk, splenic artery, hepatic artery, gastroduodenal artery and superior mesenteric artery are caused by arteriosclerosis, arteritis, periarterial inflammation such as pancreatitis, trauma and soft tissue diseases such as Marfan and Ehlers-Danlos syndrome. An aneurysm more than 2.5 cm in diameter should be considered to prevent rupture. Meticulous imaging, including selective catheter angiography and 3D imaging with CTA or MRA is necessary before surgery or en-dovascular treatment. 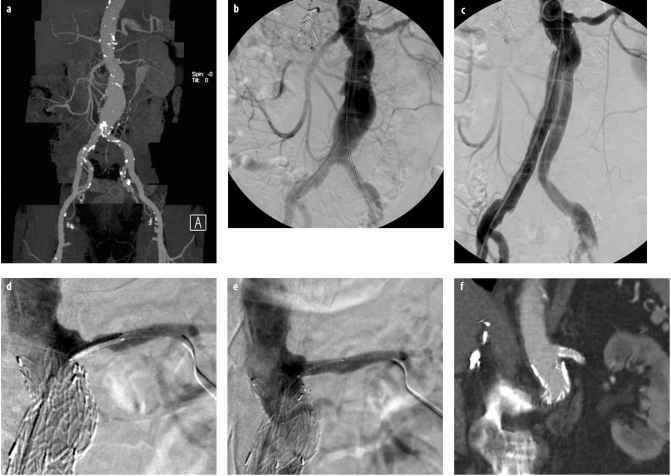 The endovascular options are em-bolization and exclusion with a stentgraft. The causes of renal artery aneurysm are arteriosclerosis, systemic vasculitis such as polyarteritis nodosa or lupus erythematosus, FMD, soft tissue disorders and trauma. Arteriosclerotic and large aneurysms are usually calcified. Potential rupture and chronic embolization are the indications for treatment. Bypass surgery, coil embolization and stentgraft implantation are the therapeutic options. Tumor embolization techniques vary from palliative em-bolization in bleeding genitoureteral tumors, chemoem-bolization techniques in hypervascularized hepatic neoplasms (in particular HCC), to definite treatment of benign lesions such as uterine fibroids. In the liver, tumor embolization is mainly used for inoperable HCC with still acceptable liver function (Child-Pugh A and B). The classical treatment is chemoembolization with doxoru-bicine mixed with lipiodol sometimes in combination with a temporary blockade of the hepatic artery by Gelfoam or other embolization particles. In randomized trials, chemoembolization of unresectable HCC has shown to be superior to supportive treatment only. New techniques include doxorubicine-loaded particles as an alternative embolization agent for HCC, chemoperfusion with different cytotoxic agents for metastatic disease and intrahepatic radiation by radioactive particles directly injected into the hepatic arteries. Bleeding in the abdomen may occur due to iatrogenic causes, particularly in the kidneys and the liver after percutaneous interventions, trauma and tumor. Frequent and typical locations are renal arteriovenous fistulas due to nephrostomy (Fig. 6) or biopsy, laceration of the hepatic arteries by percutaneous manipulations, psoas and pelvic bleeding due to traumatic arterial injury and also post partum. Temporary occlusion of the uterine artery can then be a valid alternative to emergency hysterectomy in patients with intractable bleeding due to an atonic uterus. In other locations, type, source and location of the bleeding determine the method that is used to safely interrupt extravasations. 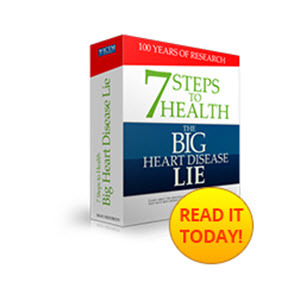 TIPS was introduced into clinical medicine at the end of the eighties. In the meantime, a standardized technique has become available that allows safe application of this artificial connection. The introduction of stentgrafts instead of bare stents led to an improved patency of the shunt tract. Stentgrafts are indicated in acute and chronic bleeders, in patients with liver cirrhosis and esophageal varices, and patients with intractable ascites. Its risks are liver failure from shunted blood volume, and encephalopathy. Endoscopic techniques to treat varices are competitive techniques in bleeders, but in some patients with ascites there are few alternatives. In patients with acute or subacute Budd-Chiari syndrome, TIPS can be a life-saving procedure and help to overcome the acute phase, but is burdened by a relatively high rethrombosis rate. Tract reobstruction requires a number of different techniques for debulking the stenosed or thrombosed stents, including mechanical thrombectomy, atherectomy, PTA, re-stenting or stent graft implantation. Besides TIPS application, a transjugular approach can be used for transjugular liver biopsy in patients with ascites or bleeding disorders, or as an entrance to the portal system, for example, to treat segmental hypertension due to stenoses that are located proximally to the portal vein, such as the mesenteric or splenic vein. Also recanaliza-tion of thrombotic portal occlusions may be treated via the transjugular approach to create a conduit that allows outflow from the recanalized vein. The portal vein may also be accessed in a transhepat-ic fashion for selective blood sampling or venous re-canalization. An intervention of increasing importance is preoperative embolization of the right portal vein in order to induce hypertrophy of the left hepatic lobe prior to extended right hemihepatectomy.